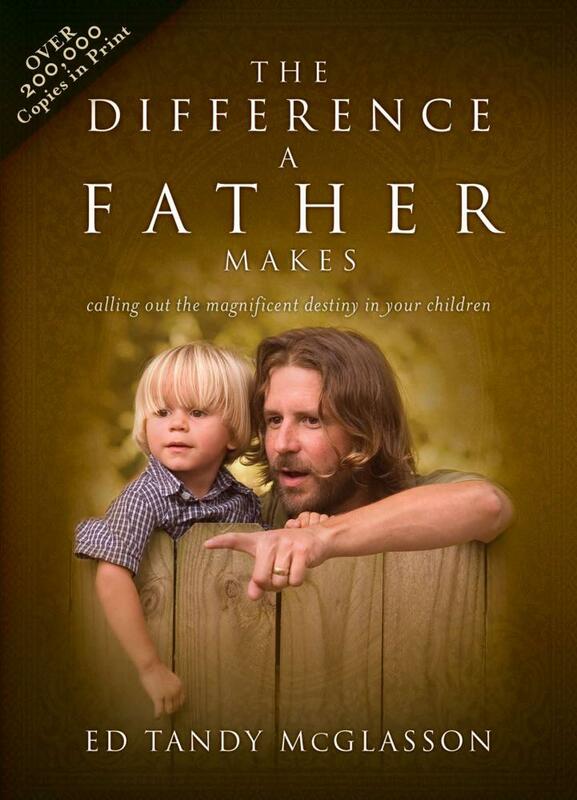 If you've never had the relationship you wanted with your father, this book is for you. This best seller has opened the hearts of both men and women suffering from a father wound to find hope and healing. It has helped them become the mom or dad their children need. In The Difference a Father Makes, Pastor Ed challenges dads to excel in parenthood and equips them to do so. "It is not that dads and moms don't want to bless their kids, it is that many of them just don't understand how to do it." Discover the potential you have as a father or mother to make a difference in the lives of your children! Learn how you can empower your children to pursue their dreams! Get your copy today! Hard Cover book makes a great gift for the holidays! If you have never received a blessing from your father, this book is also for you. Ed gives insight on how you can connect to the Father and receive the blessing you never got a chance to receive. In The Difference a Father Makes, Ed Tandy McGlasson challenges dads to excel in fatherhood and equips them to do so. "It is not that dads don't want to bless their kids, it is that many of them just don't understand how to do it." Discover the potential you have as a father to make a difference in the lives of your children! Learn how you can empower your children to pursue their dreams! “What does that feel like to see him smiling over you?” I asked him. When you are on the field of life, who are you looking for in the stands? While playing in the city baseball championship, my 11-year-old son, Luke, struck out in his first at-bat of the game. He put his head down and sulked as he walked back to the dugout. Looking for my reaction, he peeked out from underneath his cap, glancing in my direction. I raised my arms in victory and shouted, “You are a champion, son! You are going to blast the next one!” His countenance changed from a frown to a smile. In his next at-bat, he smacked the first pitch against the center field fence. As he rounded second base, he raised his hands and gave me the victory sign. He caught my smile over his life, and his face reflected the love I have for him. Oftentimes, Little League stands are full of moms but devoid of dads. Where are the fathers? That is the reality that haunts so many young people I meet. Do dads understand the power they have been given to make a difference in their kids’ lives? What was your dad like? Did he have his head down, shaking it in disappointment whenever you couldn’t make the big play? Did you even have a dad there? Or was he the one rooting for you, no matter what you did? If you’re a dad today, which one are you? An involved father can make all the difference in a child’s life. His love and care can be the deciding factor in helping a young one become who he or she was created to be. When our hearts are filled with security and trust in a dad who loves us, we stop living for our father’s approval, and begin to live from his approval. Out of our assurance of his unending love and commitment, we’re enabled to become the person we were created to be and, in the process, bring pleasure to our dad. If you are thinking, “I have no idea what that’s like” or “My father has never approved of anything I have done,” you’re not alone. And if you are thinking, “That’s not how I am with my son or daughter,” it’s not too late. “Go for it, dad!” I said. My daughter is 17 and will be attending college this fall. My heart was smitten so much when you shared the experience you had with your daughter that I did almost the exact same thing. I purchased a nice diamond ring for her and asked her to go to dinner with me the night before my next business trip. She was surprised, yet anxious, about the dinner; I believe because I had been traveling so much she thought I just wanted to spend some time with her. I took her out to her favorite restaurant. When we were seated and had ordered our meal, she asked, “So, what did I do?” I told her the reason I wanted to have this time with her was to let her know how much I love her and how proud I am of her. She was so excited; we both hugged and tried to hold back the tears, but I really didn’t care who was around because, at that moment, nothing else mattered. We are now reading a book together and are excited about what God has in store for us. One of the biggest problems children face in our culture is that they have no idea when they reach the goal line and become a man or a woman. Was that goal line ever defined for you? When is the day that a little boy arrives at manhood and stops striving to prove himself? How does a little girl cross over into the life of being a woman? These are all questions we must answer if we are to be fathers who help our children be all they were created to be. This book is about unleashing the incredible power God puts in us, as men, to make a difference by calling out this next generation of men and women who will become our future leaders. When a local businessman recently came by my office, he looked at me and said, “Ed, the biggest struggle in my life is learning how to deal with my teenage son. He does and says things that make me want to rip his head off. I find myself battling with a lot of anger. I blurt things out that crush him. I find myself doing the same things that my father did to me. I so much want to be a father who calls out the greatness that I know is in my son. But I don’t know how to do it.” While many men desire to be the kind of father who breathes life into their kids’ lives, they’ve never been given a road map for how to fulfill that desired role. In the following pages, I want to take you on a journey of discovery, where we uncover the hidden treasures of what it means to be a father who makes a difference in the lives of his children. Our discussion will be frank and heartfelt, challenging you to be the dad perhaps you yourself never had. And even if you never had a father, I will show you how to connect with the greatest Father of all time and to live your life under His smile. I was determined from the writing of the first page of this book not only to share my journey, but to answer the “Yeah, but how do I do it?” question. I remember the first day of training camp when I was drafted by the New York Jets football team. The coaching staff handed each of us a six-inch thick playbook, filled with hundreds of football plays. When head coach Walt Michaels stood up to make his opening speech, he held up the playbook and said, “Men, it is your responsibility to learn these plays. I am not going to hold your hand and make you study this, but there is one thing that will keep you from making this team.” Then he said something I have never forgotten. Most of the young fathers I meet want to make a difference, but they don’t know how. In so many of their stories, their own father’s blessing was missing. How can a son who has never had his father bless him give a blessing to his kids? We are going to walk through that question together. I have included a playbook at the back of this book that will teach you the impact positive affirmation, public blessing, shared rituals and values, quality time, built-in structure, and consistent celebration will have on the lives of your kids or those you are mentoring. My hope is that this book leaves you a changed man with a changed family. Do you desire to unleash the potential in your kids, helping them soar to unfathomable heights? In The Difference a Father Makes, Ed Tandy McGlasson challenges dads to excel in fatherhood and equips them to do so. Ed explains how setting up goal lines in the lives of children to make their entrance into adulthood is a must – and a father’s job does not end there. Discover the potential you have to make a difference in the lives of your children! Learn how you can empower your children to pursue their dreams! Ed Tandy McGlasson, a former lineman in the National Football League, pastors the Stadium Vineyard Church in Anaheim, Ca. He played for the Rams, Jets, and Giants before entering full-time ministry. He has spoken at numerous conferences across the country. Ed and his wife, Jill, live in Orange, Ca., with their five children: Edward, Jessica, Mary, Luke, and Joshua. What a big little book! This should be a father's day give away in churches. This little book has such a real truth and gives not only problems, but solutions. I am very impressed with how short but solid this book is. Dads need this book! Ed McGlasson was a guest on our radio show this morning in Detroit, and generated one of the largest listener responses we have ever received from an author. Ed actually took the time to call my co-host's husband directly, encouraging him to read the book. He did, and found himself completely re-energized by the experience. This is a book for every man, father or father-to-be. Fatherhood is like a bull elephant in a china shop. It's affect will be brutally felt. As a father and a pastor I've thought, fought, and taught through quite a bit about the subject of fatherhood, and I am elated to have found this resource. I read this book in one sitting - skipping the gym and forgetting the Red Sox on TV (that last one is notable for me). This shows that McGlasson is engaging. He effectively hammers home the truth that fatherhood is deeply foundational to the identity of a child. This leads you to McGlasson's big idea: The Fatherhood of God enables, inspires, and guides the difference a father makes. This little book offers four treasures. First, you'll be reminded again of the incredible importance of fatherhood. Second, your attention will be drawn to the Gospel of Jesus as means to having the God of the Universe as your Father. Third, you'll see beautiful things in the relationship of the Father God with the Son of God. Fourth - and this is the unique contribution of this book - McGlasson will offer powerful, practical ways to make that difference in your child's life. The book is brief. There's more to say about fatherhood. And my eyebrows raised a few times at some of his Scriptural interpretations. But as I finished, I was ready to buy a bunch of copies and hand them to the men in my church. Again, I found this book unique in the way it opens one heart to fatherhood, opens a father's heart to his children, and opens one mind on practical ways to "make that difference" to your child. Read "The Difference A Father Makes." You'll be affected. And it will make a difference. As a young man who is going to be a dad for the first time in April, I am so glad I came across this book! Every man who wants to make a difference in the life of a young person needs to pick this book up. A generation is crying out for father's who live this way! Man, what a difference this book would make if every man would read and follow it in our country---and in the world for that matter. I am a mother of an adult son who struggles with issues from his childhood due to his relationship with his father, my husband. I wanted to know what I could do as a mother and as a wife to help mend that struggling relationship between my son and my husband. I needed to know my role in this whole scenario between a father and son. It was extremely difficult and stressful for me to be in the middle. I heard Ed Tandy McGlasson one day on Focus on the Family, and then I ordered and read his two books, "The Difference a Father Makes" and "The Father You've Always Wanted". The books gave me immeasurable insight into the extreme importance of a godly father figure in the life of a child. The other WOW factor was that I emailed Ed McGlasson for advice (he gives his email address in the book), and he returned my email immediately with words that calmed my fears and gave me a peace unknowing to me, next to God. I gave my copy of the books to my son, and then ordered more copies for my husband, son-in-law, etc. Ed. McGlasson emphasized that a lot of our worldly problems these days would be helped with the simple solution of more godly men, more godly fathers. I believe it! I hope and pray that this book will help others as much as it has helped me! I now have hope that some day my husband, 2 children, and I can be the family that God intends for us to be. It works!, a book that provides a true tangible blessing for you and your children that will change your family relationships forever! Ed has test proofed this material in our church over the last ten years. It works (underlined)! I have seen our men come alive as they experienced the love of their father as other men spoke 'the blessing' over their lives. This has taught our men to move from the heart in speaking 'the blessing' over the hearts of their sons and daughters. I have four adult children, and without a doubt Ed has shown me and our church what a difference a father makes. I cannot begin to express how much I enjoyed the presentation you made of the role of a Righteous Father, and hope that everybody, whether Christian or Jew, will take the time to read this book and see the role of the father and how important it is in the development of a child that is strong and faithful. The book made me cry, made me exult in my own relationship with my dad while I was a child, and as a man as well. An excellent job capturing the essence of the Bar Mitzvah(or Bat Mitzvah) experience! May Hashem bless this work as a wonderful interfaith bridge as well. When is the last time you read a book that one minute you are laughing out loud and the next you are fighting back tears? I wish I had this information when our children were young - but I have three sons, Mike, Tom, Marc - each have small children - I'm gift wrapping one for each of them - confident they will be using these tools very soon. I laughed and cried through this book. Before knowing Ed was working on a book, I actually saw Ed giving out something to a crowd in a vision and the were all weeping. Now I know what they were weeping about. The need to know the Father and to get through the natural hindrances we have had built in to our upbringings is so critical, and this book gets to the root of it. To restore us to the father means raising up better fathers who will raise up our next generation, a fatherless one. The enemy gets one huge slap to the face with the writing of this book. Let the healing come! Let healthy fathers spring up all over the world! This book should be on the desk, nightstand or kitchen table of everyone who is concerned about the health and spiritual growth of their families.